Description: The Bob Popper Ghoul is a box about 8 inches wide, 20 inches long, and 8 inches deep. This box contains a hinged, camouflaged lid, is buried in the ground, and, under proper lighting, becomes invisible. When a TOT walks by, the Bob Popper Ghoul can be triggered, causing a head/mask/creature to suddenly pop up out of the ground. The grave popper, a.k.a. Bob Popper Ghoul, was developed in the summer of 1997. This is essentially a spinn-off from the Grave Jumper, developed by Doug Ferguson. It uses the same pneumatic setup, but in a different layout to accomplish a slightly different effect. 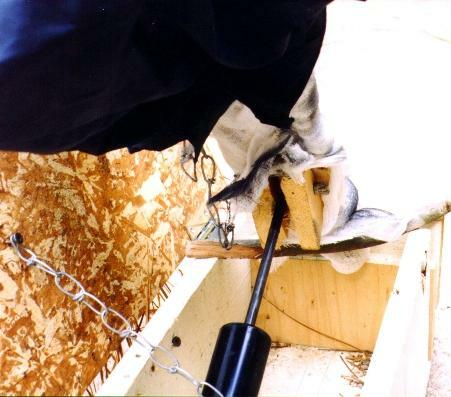 A good, strong travel-limiting chain should be employed in the event that the screen door closer or some other part of the device fails. Also, if a solenoid is used to control air flow, you must understand how to safely work with electricity. 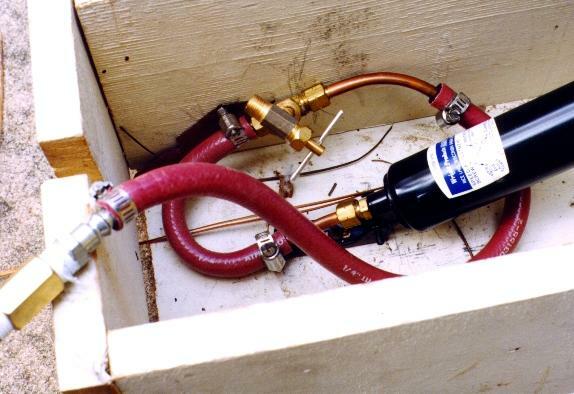 This is an image of the air setup involved. Pretty much everything can be found in the plumbing section of your local hardware store. Air flows in through tubing and comes to a T-Section. On one end of this T-section is a needel (bleeder) valve. From the other part of the T, the air goes into a fitting which is threaded into the exhaust port of a heavy duty screen door closer. In this version, a manual valve triggers the Popper Ghoul. However, it is possible to use a hot/cold washing machine solenoid both to trigger the prop and to replace the bleeder valve, although I did not do this because of cost. It is HIGHLY recommended to use a soleniod becasue, with the solenoid, the activation time of the prop will go way down. Otherwise, there will be a two or three second delay and a loud HISSING sound before the ghoul flies up out of the box. holes and the center of the throw of the air ram. 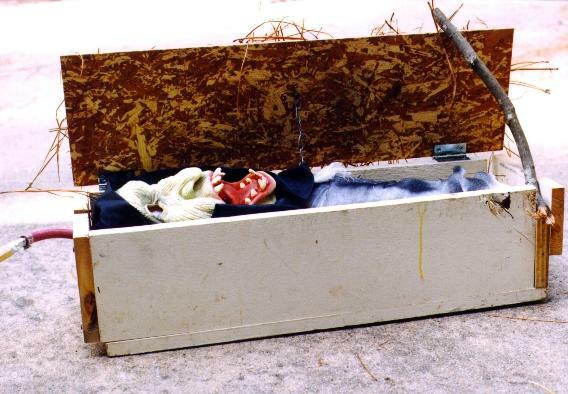 For what it's worth, this prop didn't really scare many people. The hissing caused by the bleeder valve, which could have been eliminated with a washing machine hot/cold solenoid, gave the prop away. Plus, it wasn't that big of a thing popping out of the ground, either, so people didn't have much to react to.